This article will discuss the various key strategies you can add to your arsenal of weapons while battling it out on the MTT poker felt. During the early stages of a Multi Table Tournament (MTT) players can often find themselves forced in to a position where they have committed too much of there chip stacks in spots that could have been avoided. One of the first things you should check upon deciding whether to enter the tournament should be the tournament structure. Here you can discover what the starting stacks are, how much time before the blinds increase in each level as well as when the ante’s kick in. You can often get a great feel for the amount of time you will have during the early levels to make something happen. Tournament structures can vary from poker site to poker site, so be sure to experiment with different sites until you find one that best suits you. Most online poker freeze out tournaments start players with 1500 chips with the exception of some guaranteed MTT’s on PokerStars and Full Tilt Poker. That means that in a typical tournament with a starting big blind of 20 (10/20) you will be given the equivalent of 75 big blinds to begin. Knowing this simple information helps prepare you in knowing how fast the tournament needs to be played. Rather than coming out blazing you should first take note of your table action. Paying close attention to such details like the standard preflop raise amount, which players seem to limp rather than open raise, who are the tight/loose players will benefit you greatly in the coming rounds. You should be looking for ways to stay a move ahead of the competition, and observing them beforehand will greatly amplify the odds of doing so. Think of the tournament like a great chess match. The more information you are able to collect, the easier your decision making becomes when we pick up our monster hand and attack later. 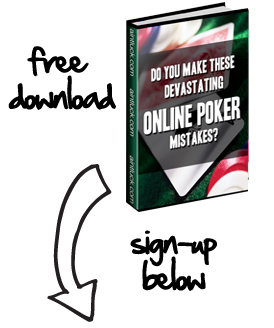 In addition to the above paragraph one of the key elements any top poker professional possess is the ability to be disciplined. You need to remain focused and patiently wait for your time to pick a great spot to accumulate chips. Given that it is the beginning stages of the MTT tournament as opposed to the end game, you do have a bit more time at your disposal. Value every chip you have, for this is a marathon not a sprint. While it is true that you must eventually gather all chips in play, you cannot win the tournament in 15 minutes. One of the most common mistakes made by beginners and veterans alike seem to be that of lost focus. When playing a MTT tournament that will last several hours you should do your best to give yourself the best chance of staying mentally in the zone. If you have outside distractions constantly needing your attention, you may find yourself making errors that could have been easily avoided. Which hands you decide to play will ultimately decide your fate. It is not a myth that many novices to the game play far to many hands. Just because you start with 75 big blinds does not justify spewing chips. However folding every hand will not only blind you out, it will force you into some tricky situations should you become a short stack. You should mix up your hand selection in moderation. Position is far and away the best way to minimize your losses while maximizing your gains. I cannot over preach the power of position. Any hand is much more valuable on the button than it is under the gun for the simple fact that you have the added knowledge of how the players before you acted. I will often limp the button behind a few limpers with a hand that is often considered weak such as 56 suited. That way I can see a cheap flop and toss it away at a small loss should I miss the flop or win a big pot when I flop a monster as the hand is pretty disguised. Every poker player has gone through it too many times to count. You put yourself in a perfect position to double up with your pocket aces only to have that dreaded 2 outer shine its ugly face again. Often the easiest route to you after such a bad beat is to give up and lose focus at this time and just stick your chips in. Do not succumb to this notion and ignore those thoughts. Get those positive thoughts spinning back in your head and look at the brighter side of things. You still have chips! As noted earlier the blind levels can be so small at the earlier levels of an Multi-Table Tournament, that it can allow you to rebound back from the small stack. Remember Jack Strauss won the Main Event of the World Series of Poker with just one chip. Use this fuel to ignite your fire and get right back in there like you have something to prove. Turn on some mellow music, get your game face on and show the table that you really are there to compete. Although often over looked and many times played on auto pilot, the beginning stages of a Multi Table Poker tournament can often dictate how well your tournament will go. Remember our 3 simple steps to success: Attention to detail, the power of position, and discipline. You can practice Early Stage MTT Strategy online at Cake Poker.